Two tone watch face and band to coordinate with all your jewelry items. 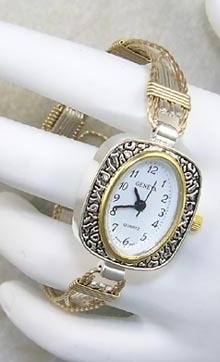 This watch works well for everyday wear and a special occasion as well. Watch band is 9 mm in width. Specify your wrist measurement and this watch will be custom made for you. To guard against possible loss of this item, a safety chain has been added.